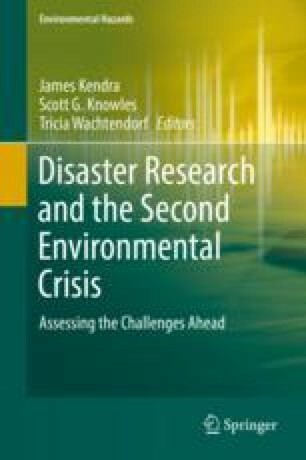 Other writers have cataloged the many contributions to understanding and practice that disaster studies have produced over the years, many of them, and the earliest, coming from sociology. The Disaster Research Center at the University of Delaware was founded in 1963 by, and is still inhabited by sociologists, but has embraced an interdisciplinary approach over time, including core and affiliated faculty from English, history, political science, civil engineering, and environmental policy). My thoughts in this essay are not confined to the DRC’s corpus of work, but ‘disaster studies’ more broadly defined below. This said, the roots of disaster studies in sociology are deep, the classic Ur-source being an unpublished PhD study of the 1917 explosion in Halifax, Nova Scotia. This disaster continues to be a source of continuing research that provide lessons for our time. My own essay will mention some of these contributions, and they are truly something to celebrate; however, the central theme I will emphasize is what has been missed and could be added to the research agenda over the next decade or so. I employ an optical metaphor that has as much to do with philosophy of science (‘vision’ and Mao’s famous question, ‘Where do ideas come from?’) as it does with optics, optometry and the detailed application of methods at micro and macro scale. The lens is a remarkable human invention. Glass shaped and polished in one way opened up the microscopic world. Treated in another, the lens gave us the telescope. I will argue that politics – the creation, use and maintenance of power to influence other people and to control space and resources – has been a largely missing raw material, like glass, from which disaster studies could shape lenses for its own tools of inquiry. Consideration of power has not been totally missing. Yet lenses fashioned from an understanding of power have not been used sufficiently in a number of critical areas of research. GNDR (Global Network of Civil Society Organisations for Disaster Reduction). (2009). Views from the Frontline 2009. Clouds but little rain. Teddington: GNDR. http://www.gndr.org/learning/resources/gndr-publications/item/1468-views-from-the-frontline-2009-report.html. GNDR (Global Network of Civil Society Organisations for Disaster Reduction). (2011). Views from the Frontline. 2011: If we do not join hands. Teddington: GNDR. http://www.globalnetwork-dr.org/programmes/views-from-the-frontline/vfl-2011.html. GNDR (Global Network of Civil Society Organisations for Disaster Reduction). (2013). Views from the Frontline 2013: Beyond 2015. Teddington: GNDR. http://www.gndr.org/learning/resources/gndr-publications/item/1464-views-from-the-frontline-2013-report.html.